Home Expert Advice Skincare Advice Natural Skincare What’s the Deal with Matcha Green Tea and Coffee in Skincare? 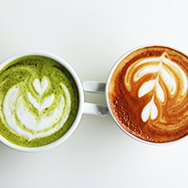 Move over, Starbucks—matcha green tea and coffee aren’t just for tasty drinks anymore. These delectable ingredients are making a big splash in the skincare world as well … but do their benefits actually measure up for skin? Here’s what the research has to say. As a skincare ingredient, research has established that green tea offers powerful anti-aging and soothing properties. In particular, the polyphenols in green tea show significant promise for improving the appearance of sun-damaged skin. Epigallocatechin gallate (EGCG) is the powerhouse antioxidant in green tea that’s believed to be responsible for its many health and appearance-improving benefits, both when consumed orally and applied topically. Matcha is a form of green tea that is farmed and processed in a specific way that helps preserve its antioxidant content. It’s known to have a higher concentration of EGCG than other forms of green tea, which makes it an appealing ingredient for both foods and cosmetics. That said, there isn’t conclusive proof that matcha is superior for skin (more comparative studies are needed). Regardless, you can rest assured that green tea and/or EGCG of any kind are a welcome addition to your skincare products. Paula’s Choice Skincare includes green tea in several products, such as our best-selling SKIN PERFECTING 2% BHA Liquid, RESIST Smoothing Primer Serum SPF 30, RESIST Weightless Body Treatment 2% BHA, and SKIN BALANCING Ultra-Sheer Daily Defense SPF 30. You can also find EGCG in some of our toners, including RESIST Advanced Replenishing Toner, CALM Redness Relief Toner Normal to Dry, and CALM Redness Relief Toner Normal to Oily. Due to its association with caffeine, coffee often shows up in products claiming to firm or lift skin. There is not a great deal of research showing caffeine has such properties; in fact, the evidence is largely anecdotal and not all that believable. Unfortunately, it just doesn’t add up—there is no research proving that coffee or caffeine of any type can tighten skin. Think about it: If that were the case, you could just apply your left-over coffee directly to skin and see results. But, coffee is not a throwaway ingredient: Coffee has other true benefits when applied topically to skin. For instance, research shows that Coffea arabica (coffee) seed oil can help restore skin and contribute to a healthier, smoother look and feel. This non-fragrant plant oil also appears to affect skin in ways that lead to greater moisture retention. Likewise, coffee seed extract is a rich source of antioxidants for skin, as is caffeine. While more studies are needed, we’re hopeful that ongoing research will reveal that all forms of coffee have benefit for skin. What About Coffee Body Scrubs? If you’re into DIY skincare, you’ve likely come across body scrub recipes that use coffee grounds + coconut oil. In general, this is not a good idea because coffee grounds can be too rough on skin. A good rule of thumb is to test it out on the back of your hand first. If it feels even the tiniest bit scratchy, stop at once because abrasive scrubs will only make skin worse in the long run. Don’t confuse how coffee scrubs work with what an AHA or BHA exfoliant does. Scrubs simply refine the very surface of skin; they cannot remove the thick, deeper built-up layers of dead or bumpy skin that AHAs and BHA can get to. If you want daily body exfoliation that’s gentle on skin try a Paula’s Choice AHA or BHA body lotion and save the coffee grounds for compost or fertilizing your garden.